Sales of large cars in Australia have plummeted – so what are people buying who have a need for lots of space? 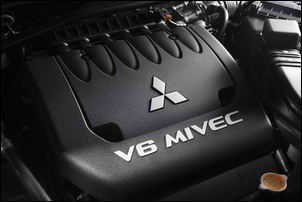 Cars like the V6-powered Mitsubishi Outlander VRX. We found the Outlander to be a rather ponderous and quite thirsty vehicle. But it also had a high equipment level, good load space versatility and a superb engine. The VG Outlander is a distinct size bigger than the first Outlander models sold here - the current model is new ‘from the ground up’. One of the design aims was to give the vehicle better load versatility and the outcome is extreme flexibility. The body design incorporates a clever horizontally split tailgate that permits a lower loading height when handling heavy and bulky items. A third row seat pops up out of the load area, allowing a total of seven to be seated. However, these extra seats are suitable only for small children - say 6 years and under. Access to the third row is via tumble-folding a section of the second seat row, a process that works well. 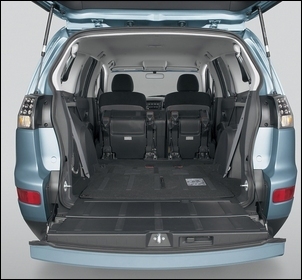 But don’t expect to carry much luggage when the Outlander is used as a 7-seater - and also be aware that the side airbags don’t extend to cover the rearmost seats. The second seat row can be electrically or manually tumbled and folded, a process that gives a large load area and a flat floor. This seat can also be slid forwards and backwards, so creating either a lot of legroom or more luggage space, as the situation requires. 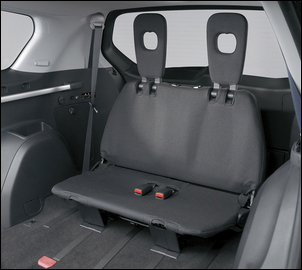 While rear space is good-to-excellent, put a baby seat in the middle and the passengers either side suffer for elbow room. No rear vents are provided. Getting in and out of the Outlander is easy – the doors open wide and the seat level is not unduly high, even for older people. Interior equipment level in the $48,990 VRX is good, with a 9 speaker Rockford Fosgate sound system, rear drop-down DVD player and screen, leather, climate control and driver’s side-only electric seat. But whether you like the end result or not depends very much on personal taste and the individual buyer’s needs. For example, the DVD player is not particularly well integrated into the car – there’s no way for the front seat passengers to see what is displayed on the screen, insert a DVD or effectively control it. So the DVD is fine if the rear seat passengers – most likely to be children – are old enough to operate it themselves, but not so good if younger ones are to be entertained. The interior of the car has hard black surfaces everywhere – again, fine if practical, easy clean surfaces are wanted but not so good if the buyers see them as cheap looking and (in summer) hot bits of plastic. The VRX comes with an automatic key – in most driving you need only keep it in your pocket. The car unlocks as you approach within 70cm of the doors and the ignition has a separate knob. However, we didn’t find the system of much use. And in fact the idea that the car will suit some and definitely not others also extends to the mechanical package. Equipped with a new SOHC per bank 3-litre V6 engine, the Outlander lunges off the line with immense torque and then sings to the redline. There is certainly no shortage of performance – but you pay for it at the pump. We got fuel consumption of 14-15 litres/100 km around town and saw a best on the open road of 11.5 litres/100km. Admittedly, the driving was in very hot conditions (and with 4WD selected – see below), but the city fuel consumption figure was a real eye-opener. The official fuel consumption test figure is 10.9 litres/100km. 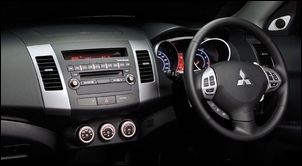 The six-speed automatic transmission is manually controllable by either steering wheel paddles or the gear lever itself. The steering wheel paddles are rather distant for those with small hands and the cruise control / auto transmission calibration relationship is poor – up one long, constant gradient country road hill, the gearbox changed between 4th and 5th gears no less than 10 times... However, in more normal conditions, the 6-speed generally behaves itself and works well with the engine. The all-wheel drive system has three driver-selectable modes - 2WD, 4WD and Lock. Four wheel drive can be selected on the fly and when enabled, actively distributes torque front/rear. However, Mitsubishi states that fuel consumption is “much better” in 2WD – but then of course you lose the active safety benefits of having all-wheel drive! For this reason we left the car in 4WD – perhaps that’s one reason the measured fuel consumption was poor. Handling is adequate – but only for this type of vehicle. On the relatively high profile tyres, the steering lacks precision and on a back country road the Outlander was lurchy and imprecise. The ride in urban conditions is jiggly. Build quality of the test car was good, with fine paint, consistent panel margins and doors that shut very well. 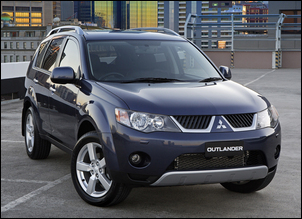 As you’ve gathered, we think assessment of the Outlander depends very much on where you’re coming from. Is the Outlander a true off-road four-wheel drive? Nope – but we’d suggest that when the occasionally slippery piece of road (snow, mud) needs to be negotiated, the ‘4WD Lock’ position will be highly advantageous. So is it a semi-frugal medium/large car that has the safety-traction advantages of all-wheel drive? Nope, not with such poor fuel consumption in 4WD mode – a huge incentive to select 2WD for normal use. So is it a true people mover, the seven seats able to be filled day-in and day-out? Again no, not with the resulting reduction in luggage space, the lack of rear vents and the missing side airbag protection for the last row. Mitsubishi itself says the Outlander V6 buyer profile is a family with the parents in the 35 – 45 age bracket, with half having no children at home and the other half having one or two children at home. They expect the average household income to be $96,000 and buyers to be primarily living in large cities. We reckon that’s about right – but do you fit that profile?